A confessed “iced tea fanatic,” Karin Campion was tired of the sugar ending up in the bottom of the glass and thought other people might be too. On a trip to Disneyland with her family, they stopped at a cafe where her iced tea was served with a little cup of simple syrup. That confirmed her idea. While she’s trained as an architect and still practices her profession, Karin has always liked to cook for her family from their garden. She has a giant mint patch and a Meyer lemon tree. Since she loves her iced tea with mint and lemon, she experimented with infusing the simple syrup with these flavors. New for the company are Karin’s unique Vanilla Extracts. Blending the floral and aromatic qualities of Tahitian vanilla with the robust flavors of Madagascar vanilla garnered her a gold star award from Santé magazine. 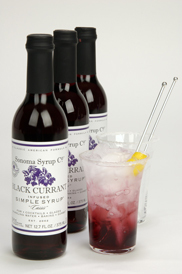 Her Vanilla Bean Extract Crush is also a blend, with the added component of vanilla bean seeds. 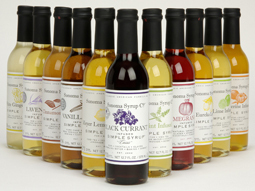 The vanilla bean syrup made with this extract won a silver award at the Fancy Food Show.